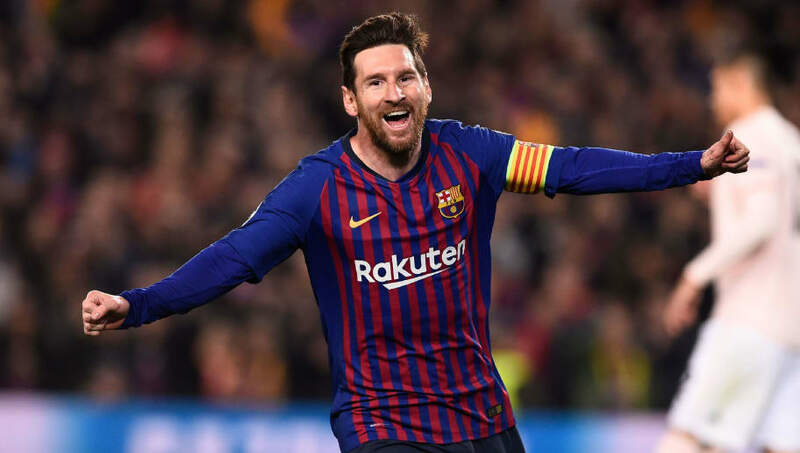 Barcelona eased into the Champions League semi-final with a comfortable 3-0 victory over Manchester United at the Camp Nou on Tuesday. The first half was full of excitement, and even the Video Assistant Referee got in on the fun by overruling a penalty for Barcelona early on. However, Lionel Messi opened the scoring shortly after with a powerful drive from outside the box. Just minutes later, he tried a similar effort which looked to be easy for David de Gea, but the Spaniard somehow allowed the ball to squeeze through him and into the net to give Barcelona a 2-0 lead at the break. If the tie wasn't already over, it was after the hour mark as Philippe Coutinho netted a stunning effort from range, before celebrating by covering his ears to silence the critics. United fought valiantly, and a late Alexis Sanchez header looked to have given United a consolation goal, only for Marc-Andre ter Stegen to pull of a sublime save to preserve the side's clean sheet and see Barcelona through to the semi-final. Having been eliminated in the quarter-finals in the last three seasons, ​Barcelona were desperate to put an end to that unwanted run. All ten outfield players were rested in Saturday's goalless draw with Huesca, and it was clear that Ernesto Valverde was not taking this lightly. They may have dropped points in ​La Liga, but it all became worth it very quickly as they comfortably powered through to the semi-final. ​Real Madrid's reign of terror in the ​Champions League is over, and Barcelona would love to be the ones to take their place on the throne. On this showing, there will be few teams who can stop them. Starting XI: ​Ter Stegen (6); Roberto (6), Pique (7), Lenglet (7), Alba (7); Busquets (6), Rakitic (7), Arthur (7); Messi (8*), Suarez (7), Coutinho (7). Substitutes: Semedo (6), Vidal (6), Dembele (6). Surprise, surprise. ​Messi has spent years dominating at the Camp Nou, and he continued that trend with a typically excellent performance against United. His first goal was a quality effort, and his second was a real gift from ​De Gea. However, his performance was much more than just goals, as Messi dropped deep to pull the strings for his side, spraying passes all over the pitch to keep them in the ascendancy. He drew players out of position, forced foul after foul, and proved why many feel as though he is on another level. ​United are a good side, but Messi is far more than just good. Ole Gunnar Solskjaer may have a good history of masterminding miracles at the Camp Nou, but even he was powerless to stop Barcelona's brilliance. He set his team up well, pressing high and bursting forward on the counter, but conceding two quick goals, the second of which was so avoidable, simply sucked the life out of his team. Few gave them much of a chance at the Camp Nou, and they fell to the superior team. Dropping out of the Champions League is never easy to take, but there is one positive to take from all this - at least the Red Devils can focus on the ​Premier League. The race for a top-four finish is hotting up, and United need to be at their best to fight their way into Champions League qualification. They now have nothing else on their plate, so they can go all out in the Premier League. They need to qualify for next season's tournament, and that is now the only way. Starting XI:​ De Gea (4); Lindelof (6), Smalling (6), Jones (6), Young (5); McTominay (6), Fred (7*), Pogba (4), Lingard (6); Rashford (6), Martial (6). Substitutes: Dalot (6), Lukaku (6), Sanchez (6). ​Fred has picked up somewhat of a poor reputation since his move to the Premier League, but his showing at the Camp Nou should fill fans with confidence. It was by no means a perfect showing from the Brazilian, but his energy and pressing caused plenty of problems for Barcelona's midfielders, who struggled with the lack of time and space being given to them by Fred. It was the kind of performance which fans have come to expect from ​Ander Herrera. With the Spaniard potentially nearing the exit door at Old Trafford, Fred's display should earn him plenty more opportunities going forward. Barcelona host Real Sociedad on Saturday, but they will have one eye on Wednesday's Champions League action as they will take on the winners of ​Liverpool and Porto's tie in the semi-final. United will look to bounce back from this devastating blow when they travel to ​Everton on Sunday, with a top-four finish now their sole aim.